In preclinical studies with mice harbouring solid lung and metastatic cancer, mice survival increased dramatically and tumor growth was inhibited. The graph depicts the decreasing tumor volume and increasing survival curve of mice with lung cancer treated with NADAV (purple) compared with untreated lung cancer mice (yellow). 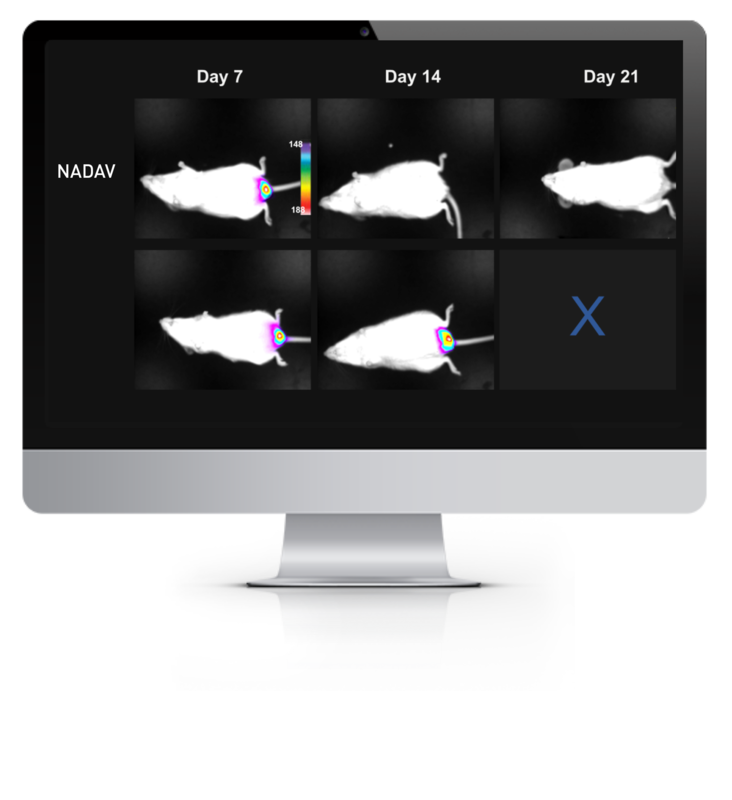 In preclinical studies in mice harbouring colorectal cancer, 60% of mice treated with NADAV showed no evidence of tumor after two weeks of treatment compared with the control group (PBS- saline only)! Mice harbouring orthotopic colorectal cancer were treated with NADAV intra-tumorally. Mice survival dramatically increased with all surviving mice showing no signs of remaining or recurrent tumor. In preclinical studies conducted on melanoma primary cells, NADAV demonstrated a strong killing effect. The graph shows that in early stage melanoma (EAR) cells, cells infected with NADAV achieved 20% cell death after treatment, while advanced stage melanoma (ADV) cells achieved 50% cell death. Furthermore, NADAV was also shown to have a greater killing effect (number of apoptotic cells) on melanoma cells compared with conventional chemotherapies such as Cisplatin, Carboplatin, Etoposide and Oxaliplatin. The graph demonstrates that in both cultures with early (EAR) and advanced (ADV) stages of melanoma, patient cells were more susceptible to the killing effect of NADAV than the chemotherapies, with the effect greatest in the advanced stages. In a further study on human advanced melanoma tumor in mice, NADAV demonstrated strong inhibition of tumor growth. 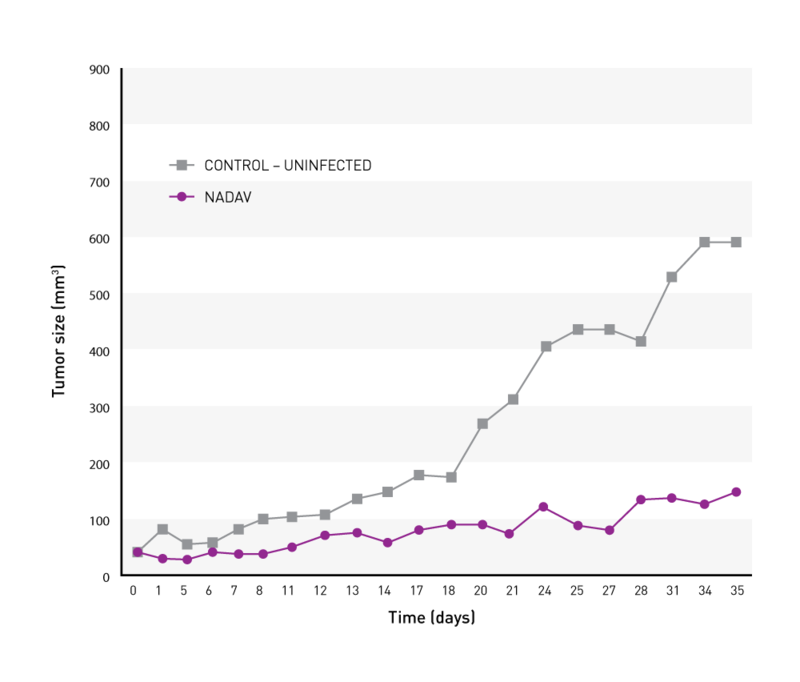 In the graph, intratumoral injection of NADAV versus control group mice, shows NADAV’s oncolytic activity with inhibition of tumor growth.